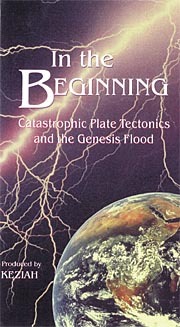 In the Beginning: Catastrophic Plate Tectonics and the Genesis Flood is a documentary exposition of Dr. John Baumgardner's new computer model of Catastrophic Plate Tectonics. Catastrophic Plate Tectonics illustrates how the division of the “Supercontinent” (Pangaea) supports the Genesis account of the global flood. Dr. John Baumgardner of the Los Alamos National Laboratory and other scientists explain how runaway thermal subduction may have caused the breakup of the early supercontinent. Five creation scientists show the likelihood of the rapid formation of the earth's crust, swift development of rocks and strata, and the plausible idea of a recent earth. The theory also helps to explain how mountains and canyons could have formed in the last few thousand years, rather than the millions of years posited by uniformitarian geology. Excellent material, attractively presented. This video features Drs. John Baumgardner, Andrew Snelling, Russell Humphreys, Larry Vardiman, and Steven Austin. This page was last modified on 6 August 2014, at 13:03.